The rain held off this morning for a nice hike through Voisey’s Brook Park in Portugal Cove – St. Philip’s. This recently developed park space, protected as a Municipal Habitat Stewardship Management Unit, has over 5 kilometres of conservations trails and a variety of habitats in a 42-hectare area. We knew the area had potential as a good birding location, but had not yet organized an event on the fresh trails. 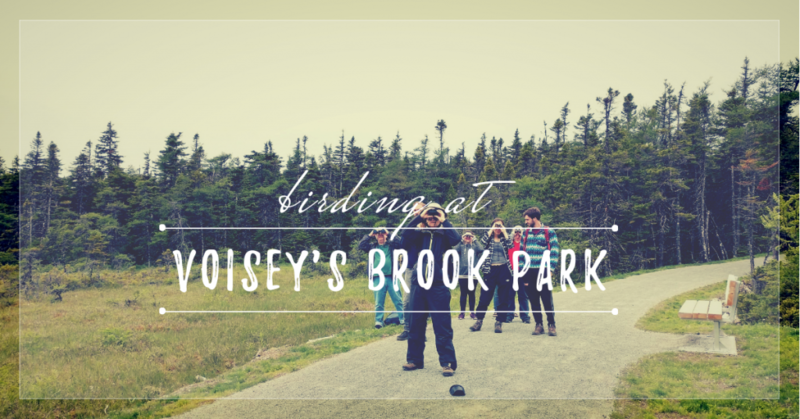 A group of 12 participants with a range of birding experience ventured into the wooded path and were quickly greeted by Twinflower, Labrador Tea, and Sheep Laurel in full bloom. A Blackpoll Warbler made itself known by its call shortly after, followed by a White-throated Sparrow and Dark-eyed Juncos. Looping to the south section the park, we came upon the Voisey’s Brook wetland where early Blue-flag Irises were sprouting up. A small group of male and female Red Crossbills feasted on Larch cones, oblivious to our presence. A Northern Waterthrush made an appearance among them and was quickly rooted out. Making our way towards Bauline Line Extension we stopped at a new lookout where Pitcher Plant flowers covered the landscape. This area, near the Jera Street park entrance, certainly offered the best bird viewing and diversity in the park. At one point a highly curious adult male Ruby-crowned Kinglet came perched directly above us. He stayed long enough to show off his bright red crest for everyone to see. We wrapped around the north section of the park noting busy Robins and Black-capped Chickadees, making it back just before the rain began. The park offers easy opportunities to view birds. It doesn’t seem to have quite the same diversity as other areas during the summer, but is certainly busy with birds and great for beginners learning calls and looking for easy interactions on accessible trails. We’ll be hosting more birding events as well as general nature hikes soon so check back for updates. As always, get in touch if you’re interested in a particular area, event, or want to become a member of NatureNL. Photos taken by Sara Jenkins, Nature NL board member and photographer.